Accreditation: Radiation Health Queensland Government. Approval No ED194. Theoretical components of the required competencies for people wishing to obtain a Use Licence and Radiation Safety Officer certificate for laser cosmetic and medical procedures. This course follows Australian and New Zealand Standards - AS/NZS 4173:2004 Guide to the Safe use of Lasers in Health Care. This is a two-day theory course giving laser and IPL science knowledge and safety guidelines for using these devices. in some Australian states this course is required as part of obtaining a Use Licence. 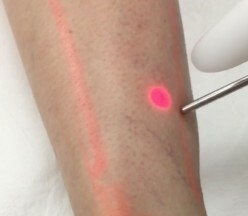 In non-regulated states it is still strongly recomended as a way of understanding laser and IPL technology and for guidelines on necessary standard operating procedures. Many insurance companies insist all staff using a laser or IPL show proof of such Laser Safety certification before they will insure the clinic/salon. There are numerous Laser Safety courses available in Australia including a number of on-line courses. Trudy's training differs from others in a number of ways. Her course is more interactive, you can ask wide ranging questions and get answers that will help relate the science of laser with what you want to do in your clinic or practice. Trudy will link the science to the various wavelengths of laser and what treatments can be done with different devices and parameters available. This will bring what is normally a rather "dry" topic alive and relate it to what you will be doing or open your eyes to new posibilities. Trudy relays the information in terms that is easily understandable, making this rather technical subject accessible to all participants. This Laser/IPL Safety Officer course is the basic study required before any further hands-on training is undertaken in the use of various lasers or IPL devices. No pre-requisites are needed for this course. Course includes: manuals/workbooks, morning/afternoon tea, assessment and certificate upon successful completion. This course is offered on Mondays & Tuesdays only, and will be held in Box Hill, Melbourne training rooms. Multiple choice/short answer theory paper. You will be required to study and revise the information on the evening of the first day in readiness for the test paper on the afternoon of the 2nd day. Training notes, morning/afternoon tea, [BYO lunch], certificate upon successful completion. This is a intense laser hair removal course which can be completed following laser safety training. The various hair removal lasers and wavelengths and their comparative effectiveness and value are discussed along with hands on using using various lasers. A thorough understanding of hair growth, hair growth cycle, causes of abnormal growth, and how laser works to disable hair are included. Treatment programs are discussed at length along with outcome expectations. Consultations, informed consent, Fitzpatrick skin typing and test patches are all part of the training. Models are supplied for hair removal practice on various body areas with differing hair types and a variety of skin colours. All the laser wavelengths applicable for hair removal are available for use on the models, Nd:Yag, Diode and Alexandrite. Normal shot by shot along with in-motion methods are taught so you get an overall perception on what can be offered with laser hair removal. This is a specialist advanced course for those with experience using IPL devices. It consists of 2 days, one for pigment and one for vascular conditions. Mornings are spent developing an understanding of causes of pigmented conditions and vascular issues. In depth discussions of wavelength, fluence and pulse width considerations are paramount to understanding how to get optimal results, along with Fitzpatrick and tan issues. Alternative and complimentary treatments are also discussed in detail. Afternoons are spent treating clients with specific pigmented and vascular conditions. Fleming Laser can offer client on-site electrolysis training in the Melbourne area. This theory session is offered by skype or Facetime. 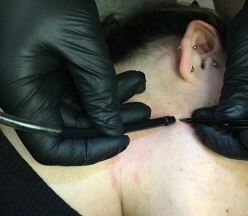 This is a two-day intensive course for laser tattoo removal. Theory education is followed by clinical hands-on training with Q Switched tattoo removal lasers. A range of people with a wide variety of tattoos are available to practice your newly developing skills. We are able to offer training with three totally different types of Q switched lasers offering a total of five wavelengths for tattoo removal. This makes it the most comprehensive tattoo removal course available anywhere in Australia. A laser safety course needs to be completed before entering this course. They can be studied consecutively or at different times depending on your needs.